When you enter our store (some say even as you approach from the street), you are greeted by a pleasant, aromatic welcome. 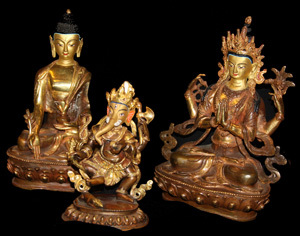 We carry two high quality incense products-Song of India Temple and Triloka Premium. These incenses are prepared from natural perfume oils, resins, herbs and other natural ingredients and hand rolled onto bamboo sticks. An unopened package of twenty sticks of Song of India works well to scent your car, closet or desk. After a month, you may burn as usual to fragrance your room. It will smell like the temples in India. 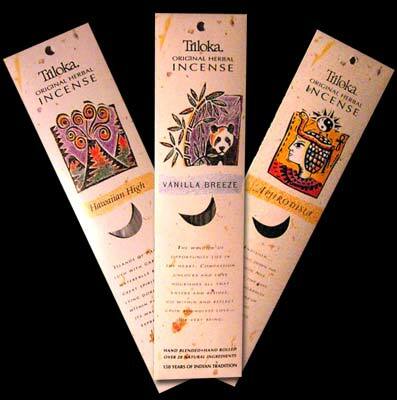 Triloka sticks are long burning and come in a large number of scents including patchouli, sandalwood, white rose, amber, lemon grass, lavender fields, and much more. You can also get assorted packs. They are great for aromatherapy. We also sell Egyptian Goddess body oils, soaps and incenses from Auric Blends. This fragrance combines soft florals, light powder and musk to create a perfume that is seductive, feminine and enticing. We plan to introduce more soaps and shea butter products in 2009.